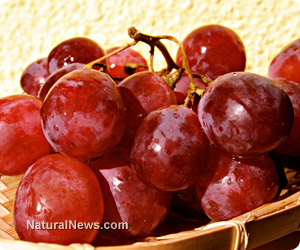 (NaturalNews) Grapes have been used by European and Middle Eastern folk healers for years for their powerful medicinal properties. Scientists have found that the grape seed has the most concentrated form of health benefits from the grape. Grape seed extracts have been shown to improve immunity and prevent cancer. Every part of the grape plant has been used to improve health. Grapevines have been made into special ointments that were used to treat skin and eye diseases. Grape leaves were used to improve healing time of painful injuries and inflammatory conditions. Unripe grapes were classically used to help the body fend off sore throats, and dried grapes (raisins) have been used to help with constipation and healthy bowel movements. Grape seed extract has an incredible antioxidant potential with its flavonoid phytonutrients. These polyphenols include resveratrol and unique oligomeric proanthocyanidin complexes (OPC's). The most potent form is in grape seed extract, as it contains 95% OPC's, which is more than any other antioxidant extract. OPC's help the body produce glutathione, which is the master antioxidant that protects DNA and strengthens the immune system. They also increase intracellular vitamin C levels and strengthen capillaries and thus improve blood oxygen circulation throughout the body. These antioxidants also act to protect soft tissue collagen in the joints and skin from free radical damage and premature aging. Many studies have shown the benefits of grape seed extract on slowing cancer growth and initiating cancer cell death. Researchers at the University of Kentucky found that the antioxidants in grape seed extract triggered the death of 76% of exposed leukemia cells by turning on a protein known as "JNK" that regulates cancer cell pathways. Other studies have shown that grape seed extracts help the liver to detoxify from radiation induced poisons and chemotherapy. In addition, they help the liver to detoxify bad estrogenic molecules. By helping the body eliminate these toxic substances, grape seed helps reduce the growth of breast, stomach, colon, prostate and lung cancer cells. The two major parts of our immune system are the Th1 and Th2 systems. It is essential that these systems are both working in a balanced and coordinated manner. Many individuals have a dominance in one of the major pathways. According to the research of Dr. Datis Kharrazian and other health experts, the components within grape seed extract tend to improve the Th2 immune system. For most individuals, this provides a great immune boost. However, some individuals have a strong Th2 dominance and anything that increases Th2 activity (which also inhibits Th1 immunity) would create a further immune imbalance and could drive further inflammatory conditions. It is advisable for individuals with Th2 dominant conditions to do a supplement challenge where they intentionally see how their body responds to grape seed extract or another Th2 stimulating compound before they use it indiscretionarily. If it is shown through a cytokine blood test or through a supplement challenge that they have a Th2 dominance, it is best to avoid grape seed extract. Kharrazian, Datis. Why Isn't My Brain Working. Elephant Press, 2013.